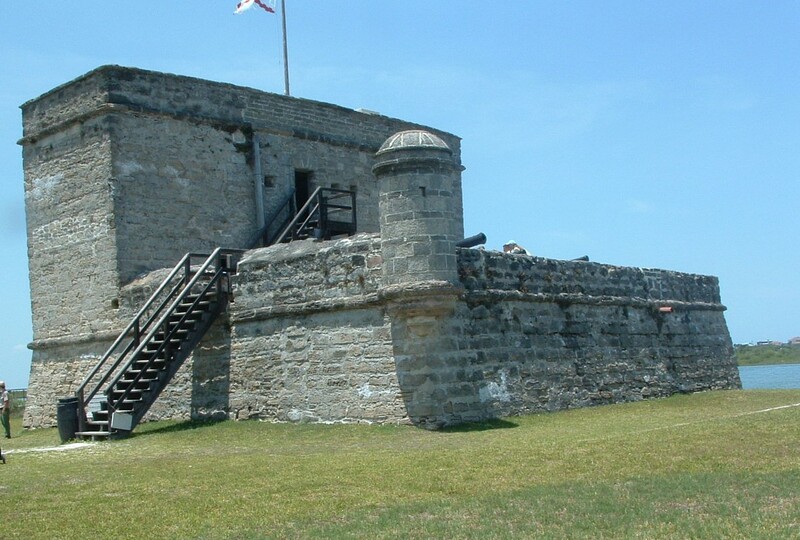 Fort Matanzas is a National Monument located outside of St. Augustine. This island has a long and varied history. In 1564 Spanish troops massacred 127 shipwrecked Frenchman who had been sent to attack St Augustine. This is how the fort and surrounding area received its name as Matanza in Spanish means massacre. In 1569 it was recognized that the Matanza area, needed some kind of defense or early warning system as it was the "back door" to St. Augustine. Then the fort consisted of a wooden watch tower and a thatched hut surrounded by a wooden fence. Watching and warning St. Augustine of any sighted ships was the primary objective since the fort had no armament. The fort as we know it today was built in 1740's on the small island, 2 acres, surrounded by water and marshland. The main purpose of this fort was to prevent enemy vessels from passing through the inlet, and therefore protecting St. Augustine. The fort usually had a compement of 7-10 enlisted men and one officer. The lower, first floor room were the enlisted mens quarters and the 2nd top floor housed the one officer on duty. The top or observation deck was the most difficult to reach.There was a small hole in the rock with a straight ladder to climb up. This deck provided an excellent view of the inlet to the south. The fort history shows that in the 80 years it was operational they only needed to fire the cannon twice at enemy troops and that no one died there during this time. The United States took possesion of Fort Matanza in 1821 but never occupied the fort. In 1916 the St. Augustine Historical Society started the initial repairs and stabilization of the fort. We conducted a pre investigation of the Fort on June 9, 2007. Investigators present were Sherri, Mike, Shereen, Jenny, Lynn, Mac and Erin. During our investigation we did not receive any deviations from our baseline EMF or temperature readings. We also did not obtain any photographic evidence of paranormal activity during this investigation. Walking up from ferry dock to back of fort. 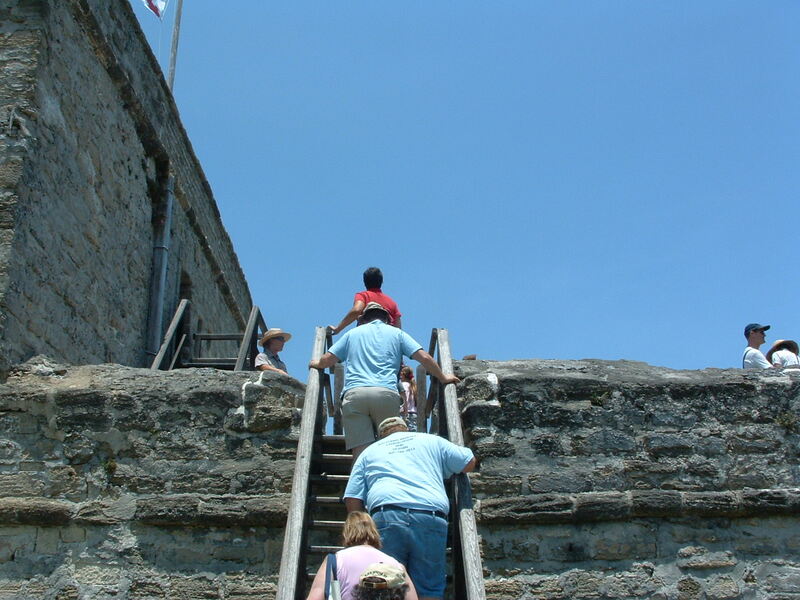 The fort originally did not have steps leading up to it, there was a ladder that was pulled up at night to prevent intruders from gaining entry. The enlisted quarters, on the lower deck is were the soldiers cooked, ate and slept. Opposite the fireplace is a long wooden sleeping platform that has 4-5 straw filled mattresses on it side by side. This was a bunk to several men at one time. The gun deck and lower part of the fort is made of solid coquina rock. This solid foundation was necessary to support the five cast iron cannon that were originally present on the gun deck. Then as now a narrow ladder was the only access to the top of the tower, or observation deck. We found this small opening in the roof a little suffocating to climb through. This observation deck is home to the forts flag pole but also provided the sentry with an excellent view of the inlet to the south and any approaching ships.